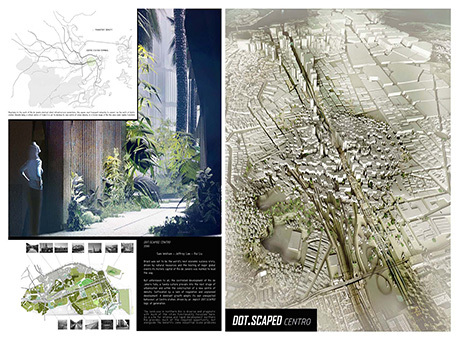 Three graduates from the Bartlett School of Architecture have received honourable mentions in an international competition organised by Italian architecture publication Cityvision. Based around the evolving landscape of Rio de Janeiro, the competition - Two Presents, One Future - was open to architects, engineers, designers, students and creatives to visualise the future of Brazil’s second-largest city. The vision detailed how this would create an unintended urban structure in the city, with incidental public squares, passageways, tunnels and paths forming as a result. The work is heavily based on their fifth-year of study at The Bartlett, where they graduated in June 2012. "For an ideas competition, I think it's about communicating one really strong image that resonates with people," says Sam George Welham. "The intention was to capture some of what makes the image of Rio de Janeiro so recognisable, then manipulate this to mean something else entirely." "With urban proposals, particularly radical ones like this, it is extremely important not to underestimate the labour involved in 3D modelling and image-making. This meant that we needed to design the digital processes of visualisation as part of the proposal. We ended up with a scripted city plan, organising pixels of new building work. This outlined the main idea, however, it needed to be carefully integrated into the context; this in essence made it look more convincing." The international jury was headed by Alejandro Zaera-Polo and also included Jeffrey Inaba, Jeroen Koolhaas, Hernan Diaz Alonso, Pedro Rivera and Cristiano Toraldo di Francia. An awards ceremony for the competition takes place in Rome on September 7th.